DETROIT (AP) — After his first IndyCar victory since 2015, Ryan Hunter-Reay could look back on some of the most frustrating moments of the drought. Hunter-Reay can finally put all that behind him after he prevailed at Belle Isle on Sunday, taking over the lead when teammate Alexander Rossi slid off the track at a turn with about seven laps to go. It was Hunter-Reay’s 17th career IndyCar victory but his first since Pocono in 2015. Rossi and Hunter-Reay both drive for Andretti Autosport. Power, this year’s Indianapolis 500 champion, returned to the top of the season standings. He’d fallen from first to third after Saturday’s race, in which Dixon outlasted Hunter-Reay for the win. 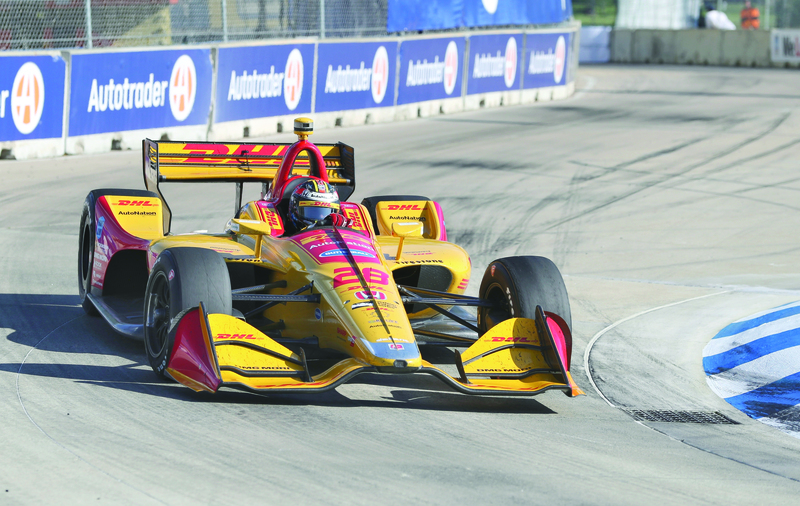 The second half of Belle Isle’s IndyCar doubleheader was Sunday. It was delayed over a half-hour because the pace car crashed during a pace lap. There was another caution right after the start when Spencer Pigot spun. After that, the race was caution free the rest of the way. Rossi led by 8.1 seconds with 16 laps to go, but Hunter-Reay quickly closed in. He trailed Rossi by 2 seconds with 10 to go, and the margin was 0.27 after lap 63. Rossi hit the brake before a turn and his front left tire appeared to fail him , and his car went straight toward a runoff area. WHO’S HOT: It was another big day for Honda, which had the top six finishers Saturday. Power was the only Chevrolet in the top six Sunday. WHO’S NOT: Josef Newgarden slid into a tire barrier in qualifying and finished 15th in Sunday’s race. That came on the heels of a ninth-place showing Saturday. PACE CAR WRECK: Mark Reuss, an executive for General Motors, was driving the pace car when it crashed. Mark Sandy, a manager with IndyCar, was a passenger. There were no serious injuries. UP NEXT: The series heads to Texas Motor Speedway for a race this coming Saturday.